This article is about the fifth King of Hawaii. For other kings of the same name, see King Kamehameha (disambiguation). For other uses, see Kamehameha (disambiguation). 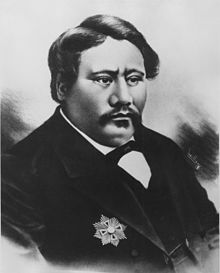 Kamehameha V (December 11, 1830– December 11, 1872), born as Lot Kapuāiwa, reigned as the fifth monarch of the Kingdom of Hawaiʻi from 1863 to 1872. His motto was "Onipaʻa": immovable, firm, steadfast or determined; he worked diligently for his people and kingdom and was described as the last great traditional chief. His full Hawaiian name prior to his succession was Lota Kapuāiwa Kalanimakua Aliʻiōlani Kalanikupuapaʻīkalaninui. Prince Lot Kapuāiwa, traveling abroad in 1850. He was born and given the name Lot Kapuāiwa December 11, 1830. His mother was Elizabeth Kīnaʻu and father was Mataio Kekūanāoʻa. His siblings included David Kamehameha, Moses Kekūāiwa, Alexander Liholiho, and Victoria Kamāmalu. Kapu āiwa means mysterious kapu or sacred one protected by supernatural powers. He was adopted using the ancient Hawaiian tradition called hānai by Princess Nāhiʻenaʻena, but she died in 1836. He was then adopted by his grandmother Queen Kalākua Kaheiheimālie and step-grandfather High Chief Ulumāheihei Hoapili. :26 His childhood was difficult; he felt that his hānai parents treated him as a stranger in their house, and that the adoption had deprived him the love of his mother. Throughout his life he would have a deep dislike for this tradition as it could be later seen by his anger at his half-sister Ruth Keelikolani giving away her second son Keolaokalani to Bernice Pauahi Bishop. It was planned that he would be Hoapili's heir as Governor of Maui, although this never happened. Since King Kamehameha III declared him eligible for the throne, he was educated at the Royal School like his cousins and siblings. He was betrothed to Bernice Pauahi at birth, but she chose to marry American Charles Reed Bishop instead. After leaving school (Kamehameha Kapalama in Hawaii), he traveled abroad with his brother Alexander Liholiho. With the supervision of their guardian Dr. Judd, Lot and his brother sailed to San Francisco in September 1849. After their tour of California, they continued on to Panama, Jamaica, New York City and Washington, D.C. They toured Europe and met with various heads of state including French president Louis Napoleon, British prince consort Albert, and US president Zachary Taylor and vice president Millard Fillmore. From 1852 to 1855 he served on the Privy Council of State, and from 1852 to 1862 in the House of Nobles. He was Minister of the Interior from 1857 to 1863, chief justice of the supreme court from 1857 to 1858, and held other offices. 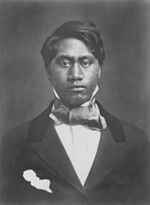 His more charismatic younger brother Prince Alexander Liholiho was chosen to become King Kamehameha IV in 1854. In 1862, he was officially added to the line of succession in an amendment to the 1852 Constitution of the Kingdom of Hawaii. Lot and his heirs, follow by his sister Princess Victoria and her heirs, would succeed in the case his brother died without any legitimate heirs. The change was made shortly before the death of Prince Albert Kamehameha, the only son of Kamehameha IV. He came to power on November 30, 1863, after his brother's death, but refused to uphold the previous constitution of 1852. In May 1864 he called for a constitutional convention. On July 7, 1864 he proposed a new constitution rather than amending the old one. The convention ran smoothly until the 62nd article. It limited voters to being residents who passed a literacy test and possessed property or had income qualifications. On August 20, 1864, he signed the 1864 Constitution of the Kingdom of Hawaii and took an oath to protect it. The constitution was based on the original draft but 20 articles were deleted. When he appointed Charles de Varigny, a French national, as minister of finance in December 1863, Americans in Hawaiʻi were convinced that he had adopted an anti-American policy. In reality, his foreign policy remained the same. Later de Varigny became minister of foreign affairs from 1865–1869. He was the first king to encourage revival of traditional practices. Under his reign, the laws against "kahunaism" were repealed. A Hawaiian Board of Medicine was established, with kahuna members, and la'au lapa'au or Hawaiian medicine was again practiced. He brought kahuna practitioners to Honolulu to document their remedies. In 1865 a bill was brought before the legislature permitting the sale of liquor to the Native Hawaiians. Kamehameha V surprised the supporters of bill, saying "I will never sign the death warrant of my people." Alcoholism was one of the many causes of the already declining population of the native Hawaiians. He was a wise sovereign; he had seen something of the world; he was educated & accomplished, & he tried hard to do well by his people, & succeeded. There was no trivial royal nonsense about him; He dressed plainly, poked about Honolulu, night or day, on his old horse, unattended; he was popular, greatly respected, and even beloved. Queen Victoria sent her second son Prince Alfred, Duke of Edinburgh on a state visit in 1869. He appealed to Kaiser Wilhelm I of Germany, who sent Henri Berger to organize the Royal Hawaiian Band, a gift of music from the king to his people. His sister and only named Heir Apparent to the throne, Crown Princess Victoria Kamāmalu had died childless in 1866 and through the remainder of his reign, Kamehameha V did not name a successor. He died on December 11, 1872 while the preparations for his birthday celebration were underway. As Lot lay bedstricken, he answered those that came to visit him: "The Good Lord cannot take me today, today is my birthday". He offered the throne to his cousin Bernice Pauahi Bishop who refused, and died an hour later without designating an heir. He was buried in the Royal Mausoleum of Hawaii at Mauna ʻAla. The throne belongs to Lunalilo; I will not appoint him, because I consider him unworthy of the position. The constitution, in case I make no nomination, provides for the election of the next King; let it be so." With no heir at his death, the next monarch would be elected by the legislature. Kamehameha V's cousin William Charles Lunalilo, a Kamehameha by birth from his mother, demanded a general election and won. The legislature agreed and Lunalilo became the first elected King of the Hawaiian Kingdom. He founded the Royal Order of Kamehameha I society and the Royal Order of Kamehameha I decoration on April 11, 1865 named to honor his grandfather. The Prince Lot Hula Festival is named for him. It was held the third Saturday in July since 1977 at his former home called Moanalua Gardens. In February 1847, a female student at the Royal School Abigail Maheha was expelled and wed in a hastily arranged marriages due to a scandalous pregnancy. Some speculate that the sixteen year-old Kamehameha V or his seventeen-year-old brother Moses Kekūāiwa was the father of Abigail's daughter Keanolani, who left living descendants. Evidence to support this claim include his financial support of Abigail's husband Keaupuni, veiled conversations the Cookes had with Abigail and Lot dated months before the pregnancy was discovered, and entries from the period which were torn out of his school journal. ^ Isabella Lucy Bird (1894). The Hawaiian archipelago: six months among the palm groves, coral reefs, and volcanoes of the Sandwich islands. G. P. Putnam's sons. p. 417. ^ Kaiulani Kanoa-Martin (2007). "Ali`iolani – Mele Inoa for Kamehameha V". Hawaiian Music and Hula Archives. Retrieved 2010-01-24. ^ Comeau 1996, p. 4; "United States of America: Hawaii: Heads of State: 1810–1898". Archived from the original on May 13, 2008. Retrieved January 15, 2016. ; "King Kamehameha V". Kamehameha Festival. ^ Peterson, Barbara Bennett (1984). Notable Women of Hawaii. Honolulu: University of Hawaii Press. p. 325. ISBN 0-8248-0820-7. ^ George S. Kanahele (1999). Emma: Hawai'i's Remarkable Queen: a Biography. University of Hawaii Press. ISBN 978-0-8248-2240-8. ^ Liliʻuokalani (Queen of Hawaii) (July 25, 2007) . Hawaii's Story by Hawaii's Queen, Liliuokalani. Lee and Shepard, reprinted by Kessinger Publishing, LLC. ISBN 0-935180-85-0. ^ Sheldon Dibble (1843). History of the Sandwich Islands. Lahainaluna: Press of the Mission Seminary. p. 292. ^ "Kamehameha, Lot office record". state archives digital collections. state of Hawaii. Archived from the original on September 6, 2015. Retrieved November 25, 2009. ^ Will Hoover (July 2, 2006). "King Kamehameha V". The Honolulu Advertiser. Retrieved 2010-01-24. ^ "Articles of Amendment of the Constitution, proposed and passed pursuant to the 105th Article of the Constitution". The Polynesian. Honolulu. August 16, 1862. p. 3. 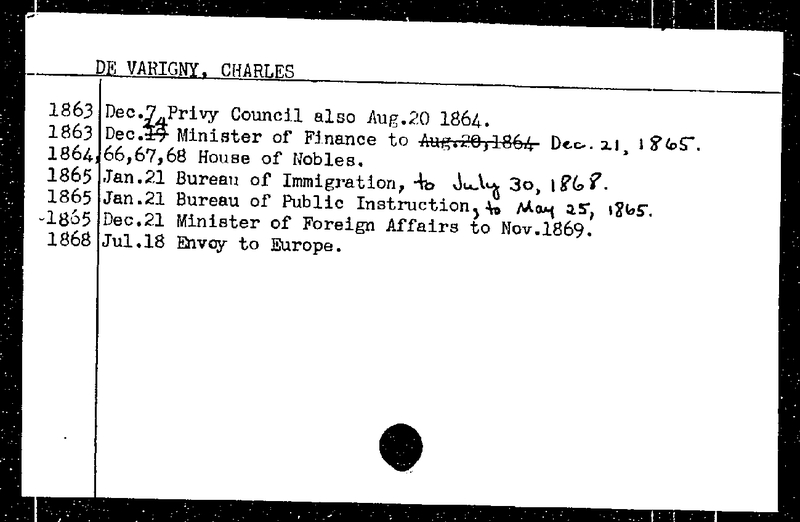 ^ "de Varigny, Charles office record". state archives digital collections. state of Hawaii. Archived from the original on 2012-03-06. Retrieved 2010-01-24. ^ Alexander, William DeWitt (1895). 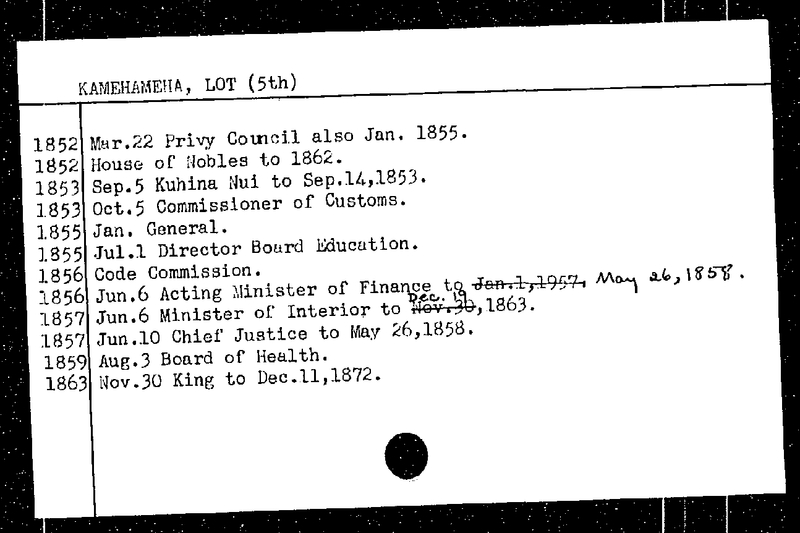 A Brief Sketch Of The Life Of Kamehameha V. Third Annual Report of the Hawaiian Historical Society for the Year 1895. Honolulu: Hawaiian Historical Society. pp. 10–11. ^ Lyman, Rufus A. (1895). Recollections of Kamehameha V. Third Annual Report of the Hawaiian Historical Society for the Year 1895. Honolulu: Hawaiian Historical Society. pp. 12–19. ^ Mark Twain (1997). Edgar Marquess Branch, ed. Mark Twain's Letters: 1872–1873. Volume 5. University of California Press. p. 565. ISBN 978-0-520-20822-3. ^ "Bandmasters of the Royal Hawaiian Band". Royal Hawaiian Band official web site. City and County of Honolulu. March 28, 2008. Archived from the original on May 29, 2010. Retrieved 2010-01-25. ^ Kanahele, George S. (2002) . Pauahi: The Kamehameha Legacy. Honolulu: Kamehameha Schools Press. pp. 110–118. ISBN 978-0-87336-005-0. OCLC 173653971. ^ Parker, David "Kawika" (2008). "Crypts of the Ali`i The Last Refuge of the Hawaiian Royalty". Tales of Our Hawaiʻi (PDF). Honolulu: Alu Like, Inc. p. 27. OCLC 309392477. Archived from the original (PDF) on November 11, 2013. ^ United States. Department of State (1895). Foreign Relations of the United States. U.S. Government Printing Office. pp. 986–. ^ Paul K. Neves. "Kamehameha Hall Nomination form". National Register of Historic Places. National Park Service. ^ "Prince Lot Hula Festival: Historical Background". Moanalua Gardens Foundation. Retrieved 2010-01-24. ^ Amos Starr Cooke and Juliette Montague Cooke (1970). Mary Atherton Richards, ed. The Hawaiian Chiefs' Children's School: a record compiled from the diary and letters of Amos Starr Cooke and Juliette Montague Cooke by their granddaughter. C. E. Tuttle Co. p. 279. ^ Keawe, J. H. (July 31, 1903). "He Kamehameha Oiaio Oia". Ka Nupepa Kuokoa. XLI (31). Honolulu. p. 1. Retrieved July 15, 2018. ^ Kam, Ralph Thomas (2017). Death Rites and Hawaiian Royalty: Funerary Practices in the Kamehameha and Kalakaua Dynasties, 1819–1953. S. I.: McFarland, Incorporated, Publishers. pp. 70–72. ISBN 978-1-4766-6846-8. OCLC 966566652. ^ Kaomea, Julie (2014). Education for Elimination in Nineteenth-Century Hawaiʻi: Settler Colonialism and the Native Hawaiian Chiefs' Children's Boarding School. History of Education Quarterly. 54. New York: History of Education Society. pp. 123–144. doi:10.1111/hoeq.12054. ISSN 0018-2680. OCLC 5571935029. ^ Walker, Jerry; Ahlo, Charles; Johnson, Rubellite Kawena (2000). Kamehameha's Children Today. Honolulu: J. Walker. p. 78. OCLC 48872973. Comeau, Rosalin Uphus (1996). Kamehameha V: Lot Kapuāiwa. Honolulu: Kamehameha Schools Press. ISBN 978-0-87336-039-5. OCLC 34752213. Kingdom of Hawaii (1865). Laws of His Majesty, Kamehameha V., king of the Hawaiian Islands, passed by the Legislative assembly at its session. Dutton, Meiric Keeler; Harris, Charles Coffin (1957). The Succession of King Kamehameha V to Hawaii's Throne: Including a Recently-Discovered Private Memorandum Written by Attorney-General C. C. Harris. Honolulu: Loomis House Press. Wikimedia Commons has media related to Kamehameha V.
"Kamehameha V". Biography from Hawaiʻi Royal Family web site. Kealii Pubs. Retrieved 2010-01-24. This page was last edited on 28 March 2019, at 16:06 (UTC).